We are proud to serve the advertising needs of the Memphis area. With our extensive inventory of Billboards and Digital Displays and the best team in the business, we will help you craft a campaign and successfully reach your target audience. 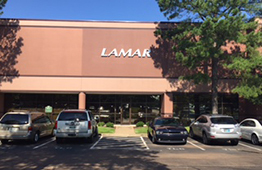 Lamar of Memphis is the premier out-of-home advertising provider in the Memphis area, the largest metropolitan area in the Mid-South. We provide traditional and digital billboard coverage across Memphis. As the only Memphis provider with posters as well as digital coverage, we can deliver targeted campaigns to African American, Hispanic, Asian and General Market audiences. Boasting the largest digital platforms in Memphis, Lamar of Memphis offers 23 digital billboards on interstate and surface street coverage, including two digital displays on historic Beale Street, which is Tennessee’s most visited tourist attraction and just feet away from the FedEx Forum home of the Memphis Grizzlies of the NBA and the Memphis Tigers of the American Athletic Conference. Memphis is also the Home of the Blues and the Birthplace of Rock and Roll, drawing in thousands of music fans and tourists each year. With so many opportunities to showcase your message, Memphis provides a fantastic backdrop to introduce new products and services, initiate a call-to-action or highlight the success of a well established brand.